Back at you with another beauty review and today's product (in my opinion at least) is an incredibly useful one for you ladies who may be a little too generous when it comes to eye products, specifically mascara and lash glue or perhaps even for those of you looking for something a bit gentler to help remove your make up generally, and surprise surprise it comes from one of my personal skincare saviours, Garnier. It all really started when I was taking off my make up at the gym, you ladies will know how it is, when you're in a rush for a class, you're trying desperately to clean off the (what feels like cemented on) make up of the day and your mascara just won't budge. You end up panicking due to your late state and vigorously rub your eyes until they're a lovely shade of scarlet, and not to mention you've yanked the majority of your lashes our along with it, well given that I felt I was down to my final three lashes per eye, I had enough and went on the hunt for something a bit kinder to my skin (and for my sanity!) 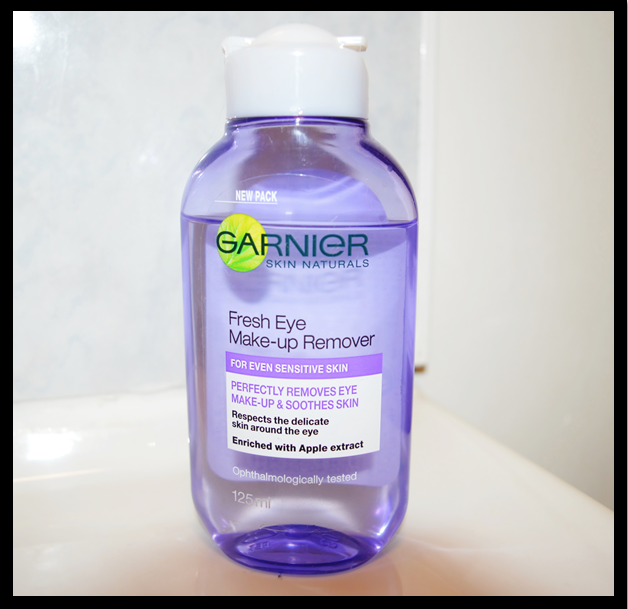 As fate would have it I then happened upon Garnier's Skin Naturals Fresh Eye Make Up Remover as part of a 2 for 1 offer, and today I wouldn't be without it! The cleanser itself is a liquid consistency and as you can imagine I was quite nervous about it all spilling out at me and essentially wasting my money, but thankfully Garnier have created a sturdy bottle that doesn't allow for leakages. What really drew me to this product was their supposed 'biphase' double action forumla which says it will clear stubborn make up (even waterproof) without the need for vigorous rubbing (it even says 'protects' eyelashes on front so double bonus!) I was quite skeptical to begin with but I'm one for giving anything a go once so in I jumped. The scent wasn't overwhelming or chemical, which is a big no no for me as these types of cleansers and removers tend to dry out my skin something chronic, this is actually a lovely fresh and clean scent that reminds me of the 'Clean Cotton' Yankee Candle (which I could sniff until the cows come home!) but I'm a terrible judge of how things smell so perhaps you should give it a whiff yourself before committing to the product. 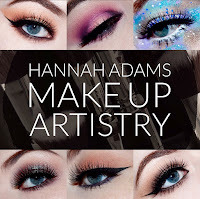 The day I tested this out, just to clarify, I was wearing eyeliner pen and pencil, eyeshadow, Benefit's Roller Lash mascara and a set of Eyelure false lashes, so it isn't as if I was simply swiping of a slick of liner, and all I can really say is wow. As well as removing all of my make up, even mascara and remnants of glue from my lashes, with no trace of panda or red eye I only had to use 2 cotton pads (a refreshing change from the usual 4 or 5) The forumla didn't sting my eyes or leave my skin greasy like my facial cleanser sometimes does and it was just a genuinely pleasant product to use. If you're looking for something that just does a damn good job of make up removal than you can stop your search right here, and you'll be saving a tonne of money on cleansing pads to boot! Of course now that I am a self confessed convert from cream to liquid make up remover I'm looking for micellar recommendations. Be sure to leave your thoughts and suggestions in the comments below, come share them with me on Twitter, or of course if you'd like to keep up with the latest Granite City Girl posts be sure to follow me on Bloglovin. Until next time folks, rubbing my eyes pretty. I think I might give this a try when my No7 one runs out. If you like this though you should give the garnier micellar make up remover a try I've also been converted to liquids over creams because of this. Funnily enough I have been eyeing up the micellar make up remover, I have a feeling I'll fall for it as hard as I have for this, liquids are so much easier to work with I have found! I'm glad you've taken something away from this post, be sure to let me know your thoughts if you do give it a go! This is my favourite drug store eye make up remover! I can't believe it has taken me so long to purchase it, I was struggling along with the cream cleanser and for my eyes too! Very sore.